While on the Pine Ridge reservation, we had a conversation with a man at the Oglala Sioux Tribe Office of Economic Development and Utilities. He referred to reservation land as indigenous land as opposed to its legal name, trust land. We were struck by his idea that land, not just people, can be indigenous. He spoke further about the intrinsic richness of the untainted land, saying that there is no reason that people on indigenous land could not rediscover ways to live off of their land, allowing them to disengage from the greater American and global capitalist system. At the moment, this is an exciting but difficult thing to do. 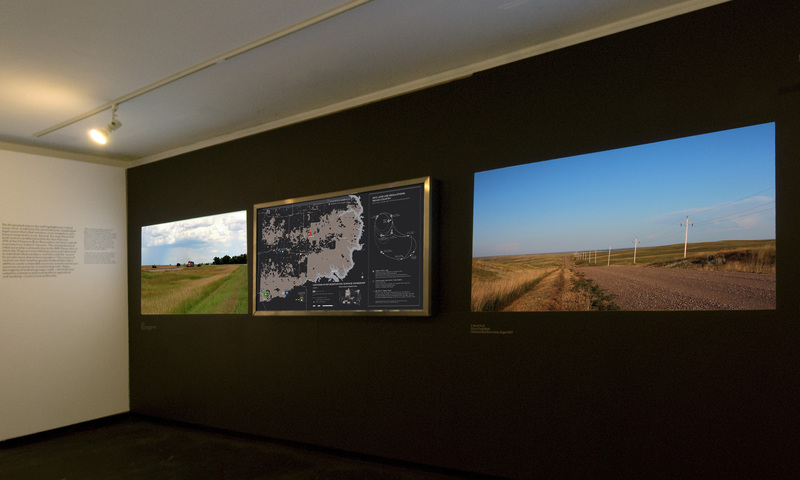 The land is not what it used to be; its indigenous animal and food supply – the buffalo – are virtually extinct, preserved only behind fences in controlled environments. Large tracts of land are over-grazed by cattle shipped in for the summer; this stunts the growth of local grasses that could hold water in their roots to help mitigate frequent droughts. Natural ecosystems, which rarely know a straight line, are disrupted by the linear carving of land into near square lots. Yet, while this altered eco-system does make it more difficult to survive solely off the indigenous land, there are plenty of indications that it is not impossible. The houses that we are continually drawn to are those made out of local material. 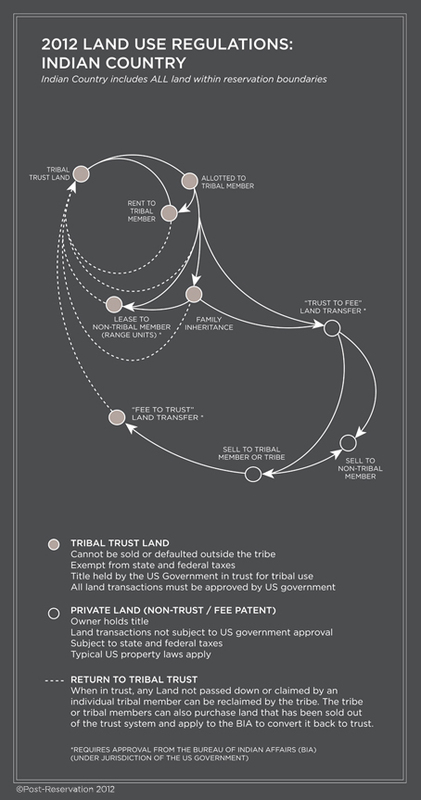 Using as much of the local material as possible preserves sovereignty on this indigenous land. And while the local tribes historically lived in tipis made out of buffalo skins, there is a history of permanent housing built by the Lakota at the turn of the century which has been grossly over-looked. 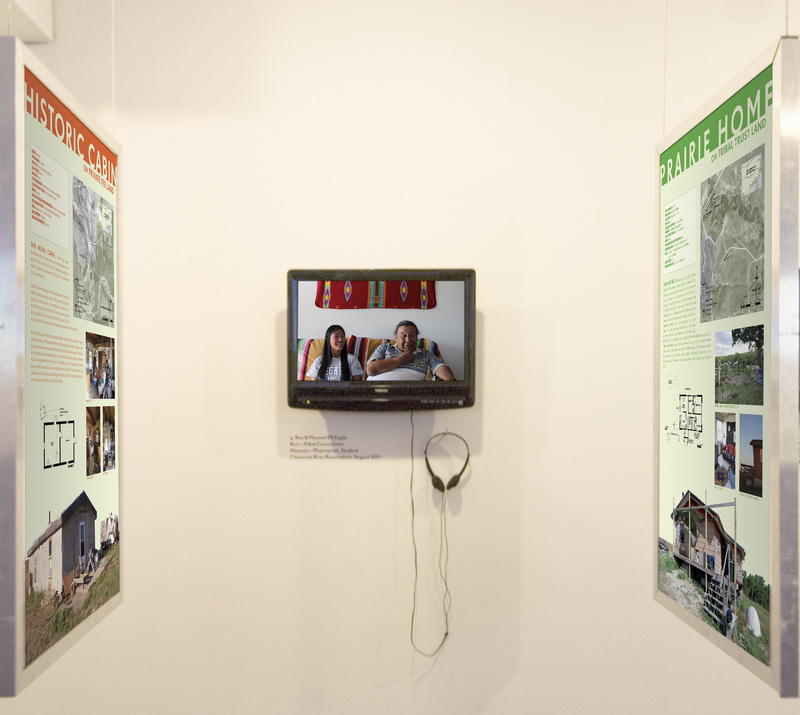 This points to an evolution of their housing typology from tipi to cabin, or nomadic to permanent. Many older people we’ve spoken to recall growing up in a two room cabin. We’ve visited many of these, most abandoned but some re-inhabited. Often times there is no memory of who built the cabins – the army corp of engineers or the Lakota. 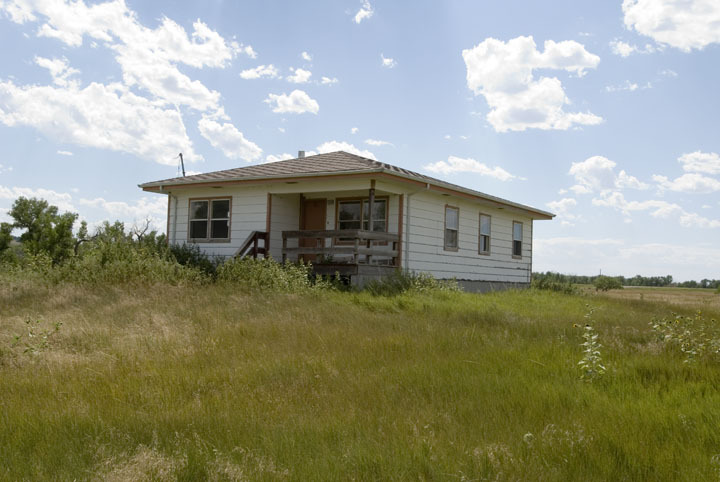 However, during our last trip we were fortunate enough to be directed towards a cabin built by Chief Iron Lightning who lived at the turn of the 20th century on the Cheyenne River Reservation. A cabin believed to be built by Chief Iron Lightning at the beginning of the 20th century. Located near the community of Iron Lightning, the cabin was a two room structure made out of logs and mud. It was also stuccoed most likely with local clay mixed with water and lime. Modern appliances and a power line at the site indicate the cabin had survived and was inhabited well into the 20th century. We were told that there are at least five cabins like this in the town of Iron Lightning. The significance of this is profound for two reasons. First, it is evidence of the Lakota modifying their way of living from nomadic to stationary without the aid of the US government. We’ve heard several times that prior to the introduction of HUD on the reservations (1960’s), everyone lived in tipis. The implication of this is that the Lakota were living a pre-modern way of life before the US government stepped in to help them out. While tipis were in fact sophisticated in many ways, it is true that their primary function ceased to be practical once the Lakota were forced to spend their winters on the harsh prairie which started in the 1890’s. This change in lifestyle was caused by two very tangible things in their life, the scarcity of the buffalo (a diminishing food source) and the confiscation of the Black Hills (their winter micro-climate). 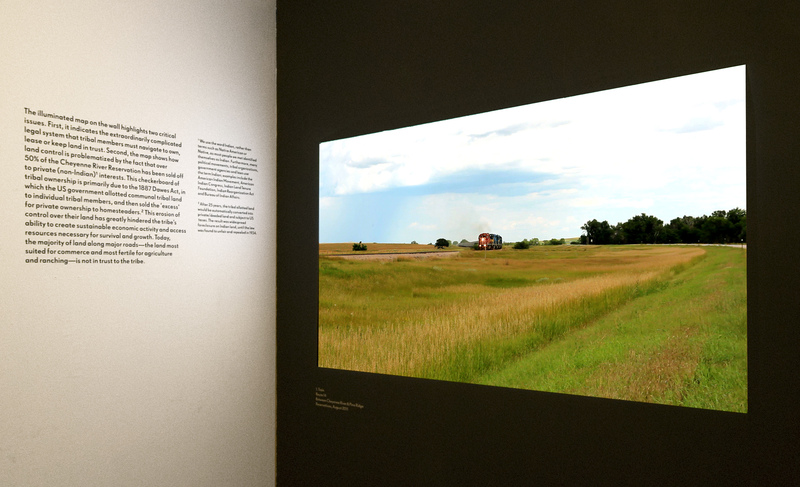 That some cabins were constructed by the Lakota is evidence of a more nuanced evolution of lifestyle and building typology than the narrative that HUD ‘saved’ the Indian from the tipi. 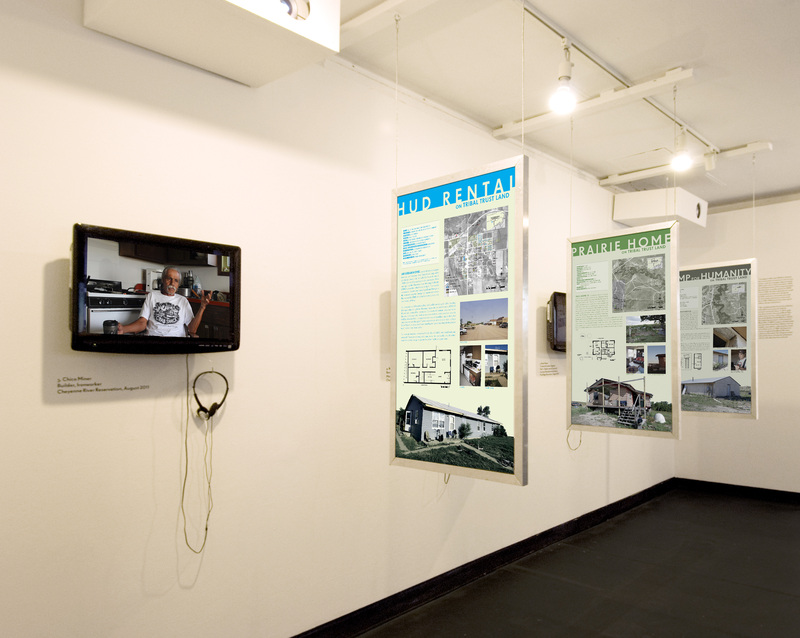 Another way to look at this history is that HUD stunted the development of indigenous building techniques with local resources, by providing pre-fabricated homes that were constructed without the help or input of the local population. 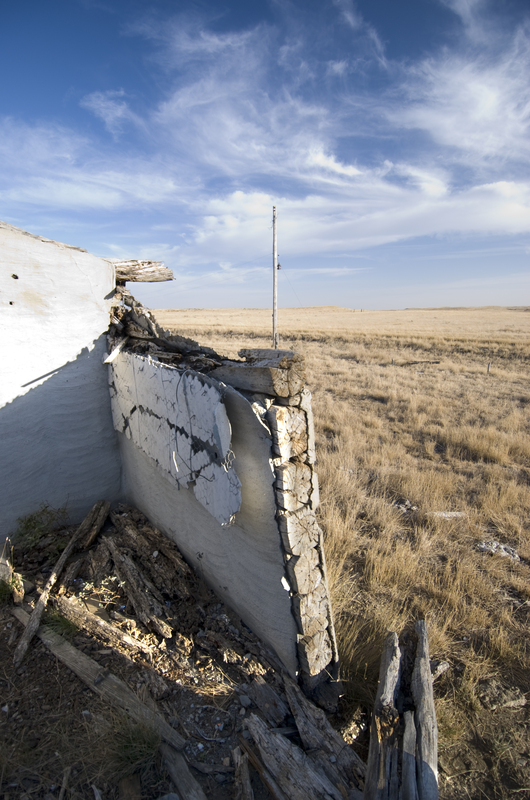 Beside being poorly constructed and ill designed for the South Dakota hot summers and harsh winters, the construction of the HUD homes disrupted the Lakota’s attempts to develop a building technique themselves. Many of the building techniques we saw that experimented with local and sustainable building technologies were one-offs, but we did meet with a group that has a larger scale development underway The Thunder Valley development group located in Sharps Corner on Pine Ridge, has taken a more holistic view on solving the housing problem by looking for longer term solutions for community development. They are in the process of building four prototypical house – one straw bale, one SIPs house, one cob and one standard stick frame house. 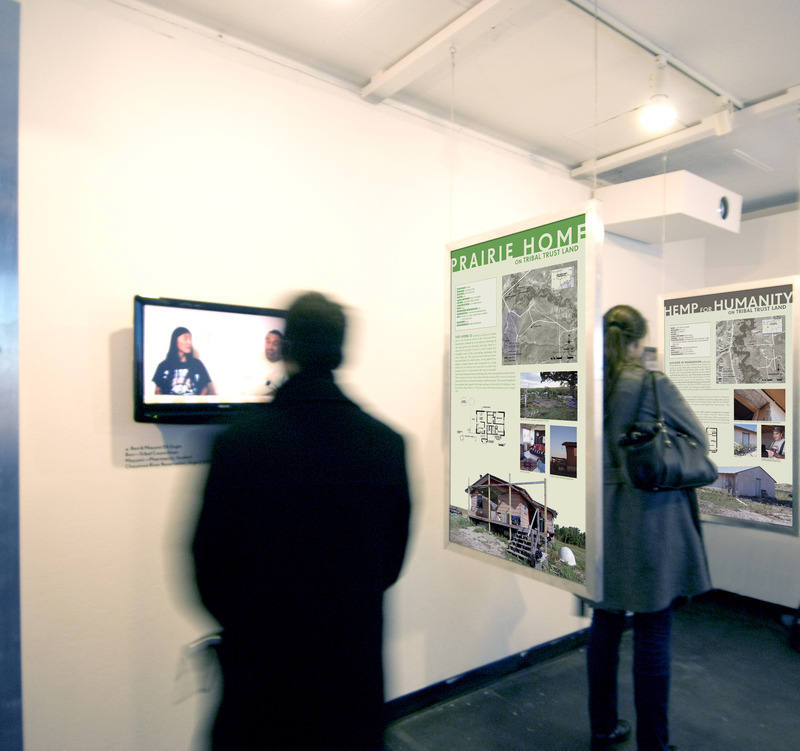 They designed the homes and chose these four building techniques after holding community meetings and getting feedback from local people about what they wanted. Once built, the four homes will be assessed for performance, sustainability and cost. Based on their assessments, 30 more homes will be built, as well as a daycare center and some buildings zoned for commerce. The Thunder Valley project is significant not just because of the investigation they’re doing on specific housing types but also because they’re looking at planning and zoning from the community’s perspective, without US government involvement. Planning on the reservations has typically been managed by US government agencies, whose interests and cultural understand are often not aligned with the local community. Specifically with regard to housing starting in the 1960’s, HUD defined the spatial organization of the reservations and rendered what had naturally occurred obsolete. However, evidence shows that there was spatial organization developing prior to HUD’s involvement and today new generations are picking up where their ancestors left off – organizing themselves and looking for way to live off their indigenous land. The map below shows the “checkboard” condition of land ownership discussed in the previous post Whose Land? Land status and regulation. *Note: The map data shown was provided by the Bureau of Indian Affairs in 2010 and is subject to change. 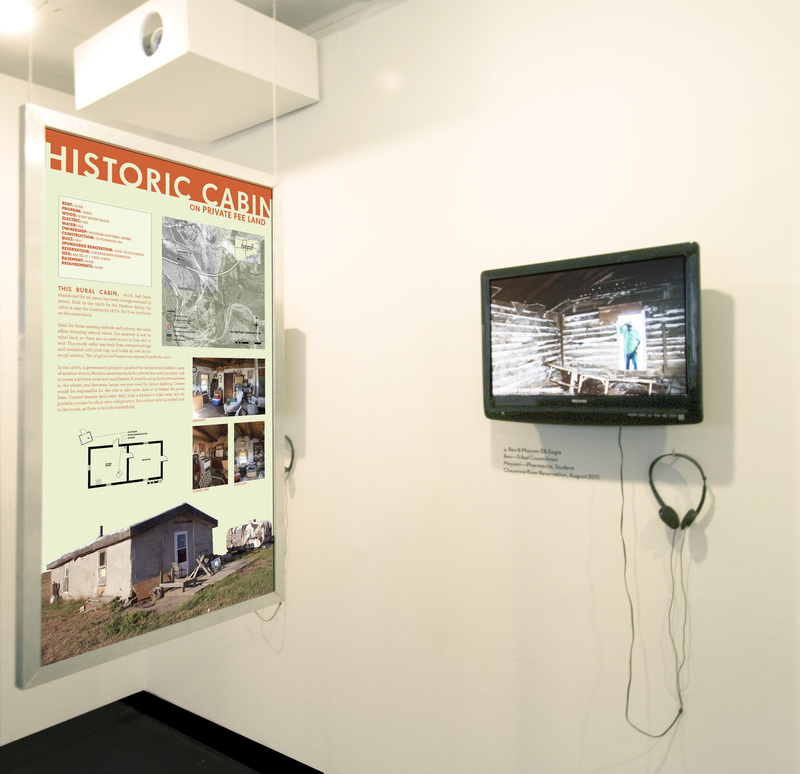 The first homes built on the reservation by non-Indians were made by homesteaders, who introduced the log cabin typology to the region. Many of the log cabins we have seen were constructed in the early 20th century out of cottonwood logs. Between the logs, these cabins were insulated with local clay. In the 1970’s, the Housing Authority improved the insulation for some of these homes by installing new windows and adding a layer of stucco on the exterior of the homes. These log cabins typically have two rooms, a pitched roof, and no plumbing, and are built on grade. We have visited two of these cabins that have been abandoned and one that is lived in. The occupied cabin we saw is outside the community of On the Tree, and had been abandoned for 6 years before the current residents moved there in September. This couple is living there with the permission of the rancher who owns the property, which is on fee land. They lease land for their horses to graze, but do not pay rent for their home. The cabin has two rooms, no running water, no electricity and a small propane tank for a gas stove. The residents currently can’t afford the cost of a water hook-up or to bring power lines to their home, but would like make that investment someday if they purchase the cabin. Currently, the house is lit by kerosene lamps, and reading is done with a camping headlamp. The small TV looked a little out of place, until we learned that it can be powered by the car battery just long enough to watch an occasional movie. Last winter, in order to heat the house using the wood burning stove, they went through 11 cords of wood, costing $100 per cord. They use two portable coolers (one small and one large) for any food storage, but must go daily to Eagle Butte, 20 minutes away, for ice and food. As for water, they have no cistern to periodically fill. Instead, they fill a 15 gallon jug at a hydrant 8 miles from their house and haul it back, twice a day. In the winter, when it is not uncommon to be snowed in and temperatures are predominately below freezing, this process can be quite difficult. Despite its lack of infrastructure, Tess, the resident we spoke with, was very happy with her home. She has made it her own, and she enjoys her privacy in the vast open land. She said the wood burning stove provides excellent heat in the front room, which becomes the whole living space in the winter. All of the furniture is salvaged, but carefully picked and placed, and the house is cozy and comfortable. 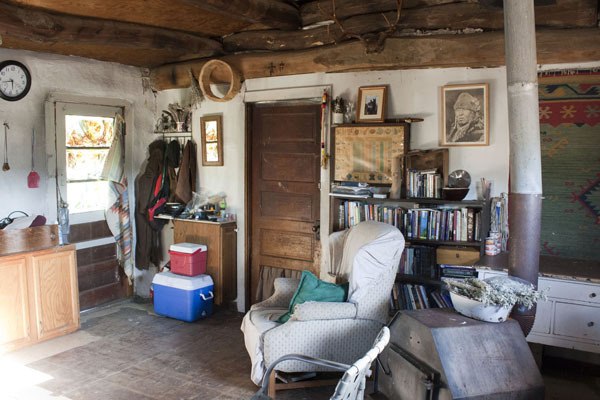 If she could change anything about the space, she would reinforce the foundation, upgrade the windows and doors, add more space for storage, get electricity – ideally through a turbine or solar panels, install a rainwater collection system, and build studio spaces for her and her husband to make their artwork. The little technology she has access to she feels is vital. For example, she checks her email at the Dakota Book Club, where on a good day two of the three computers work. She did express frustration at the unreliability of the internet there, emphasizing that she refuses to give up on certain things functioning. When we asked Tess if should would prefer to live elsewhere, she adamantly said no. She loves her home, and explained that her grandmother used to say “nothing is beyond repair”. She admits that sometimes living there is difficult and that surviving last winter was one of the most challenging things she has ever done. Ultimately though, she said that the biggest lesson she has learned is to surrender her expectations for many things. She sees this as a positive lesson, and embraces the challenges of their lifestyle as a worthwhile trade off for the independence and natural beauty she and her husband enjoy. 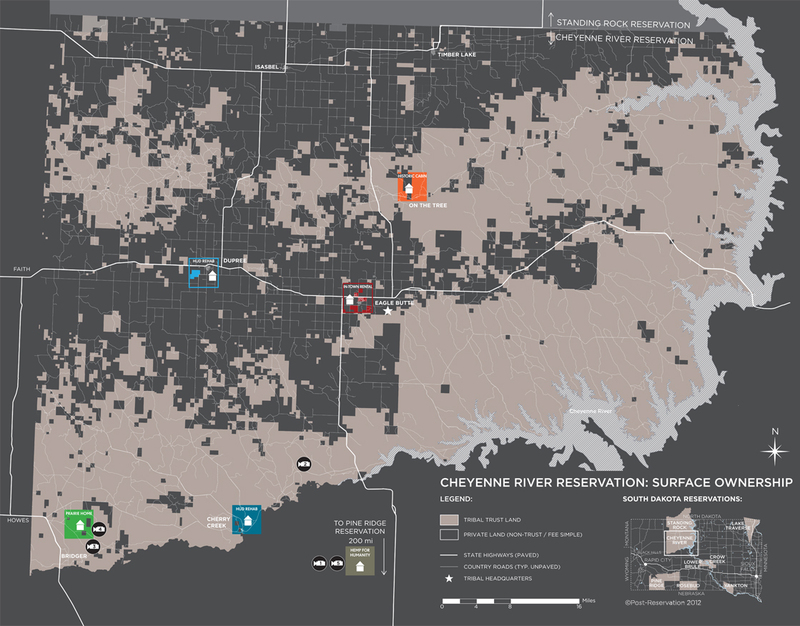 One of the biggest issues currently facing Cheyenne River Reservation development is a water shortage, which is preventing the construction of new homes, and any new water hook-ups for existing homes. The concept for a water supply and distribution system on the reservation was introduced at the infrastructural scale in the late 1960’s. By 1981, the tribe and Tri-County Water had installed an intake pump into the Cheyenne River, built a treatment plant south of Eagle Butte, and set up a main pipeline into Eagle Butte – the reservation’s largest town. Later, this main line was expanded east and west, and lines were placed north and south to pull in the outlying districts, communities and individual home sites, and to provide pasture taps (for a fee). In order to reach these outlying areas, Tri-County Water partnered with the USDA and Indian Health Services to expand and upgrade. Water storage tanks were put up in the 15 communities and 4 incorporated towns, ranging from 100,000 – 250,000 gallon capacity. Before 1981, people relied on deep (1000-2000 ft) artesian wells, which produced hard, salty water, or water delivery services. The system was soon strained by a drought that affected the area from 1997 to 2008, an increase in housing demands, and high pasturing demand. Currently the pipelines are past capacity and Tri-County Water has put a hold on all new water lines and meters. 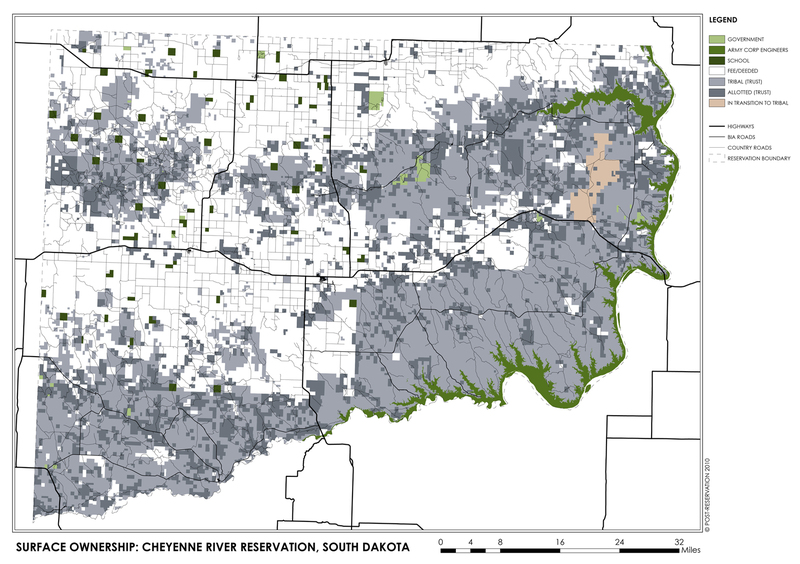 An expensive, temporary fix moved the intake from the Cheyenne River to the Missouri River, and appropriations for 60-65 million dollars would be needed to make this fix permanent and to expand the main pipeline from the intake to Eagle Butte. This is a 4-5 year project, which does not account for expanding the lines out of Eagle Butte to smaller communities. 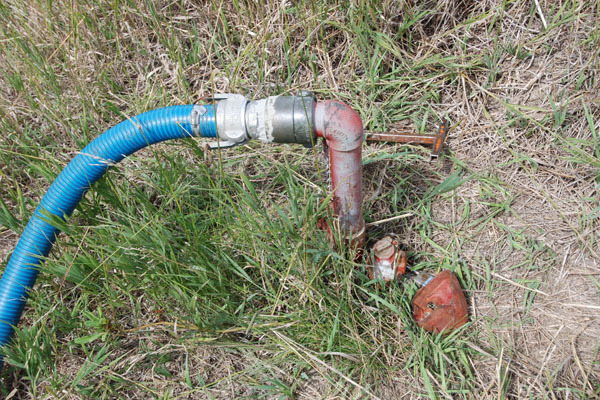 Therefore, even though the drought ended 2 years ago, water flow is still impeded by the inadequate pipelines. Originally, most rural homes built by the Housing Authority were equipped with cisterns, and received water through delivery. Over the years, many rural homes were added to the water supply system, eliminating the need for those cisterns. 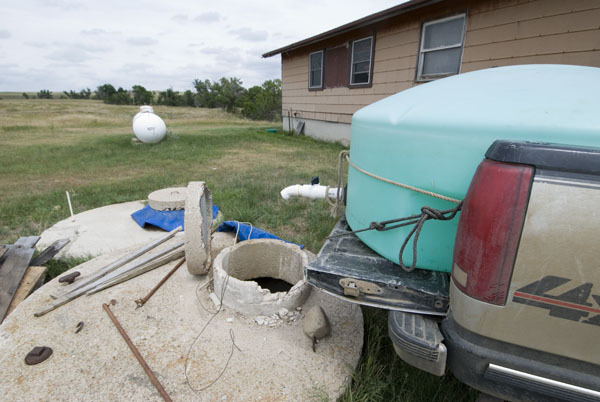 However, those who did not receive a meter before the moratorium must haul water to these cisterns in order to service their homes, as there are no delivery services left on this reservation. We recently had the opportunity to witness and assist in this process. 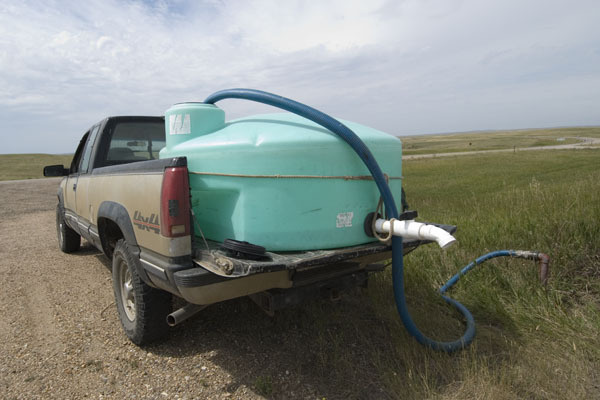 After looking in the water cistern and determining that water was needed, the process starts with securing a 300 gallon tank to the back of a pick-up truck and procuring a key and hose from the local store, off the reservation. Here, the water is purchased from neighboring Meade County. With tools in hand, we took five trips between a roadside hydrant and the home cistern, a mile long trip with some tricky truck maneuvering needed to align the tank’s spout with the cistern. In total, this process took half a day, and must be done approximately every two months by this family. As difficult as it can be during the summer, it is particularly taxing in the winter. The 1500 gallons of water supports the needs of a two-person home, where water is carefully conserved. Instead of using the indoor toilet, they opt to use an outhouse, as the water used for a toilet would require more frequent hauling. They have been requesting that Tri-County Water install a meter and line for ten years, but are still waiting. 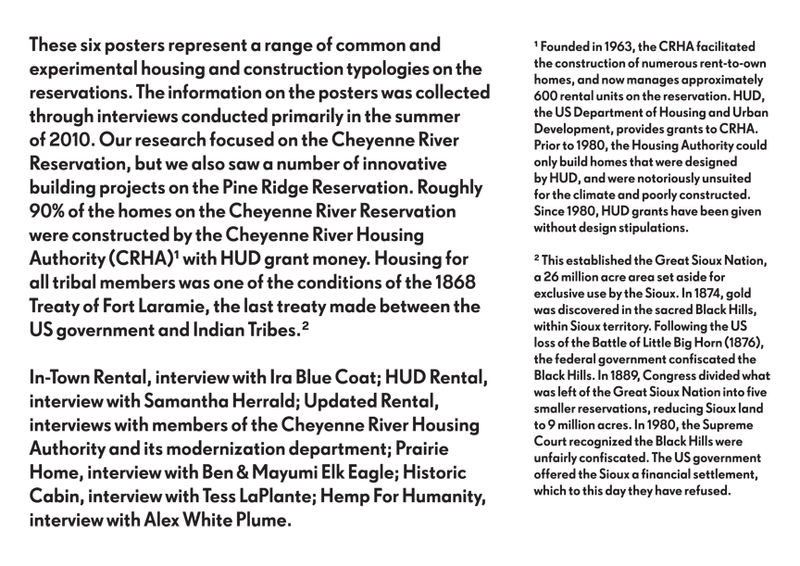 In the last few days we have seen some really exciting experimental housing and met with inspiring people with new and different visions for housing on both the Pine Ridge and Cheyenne River Reservations. 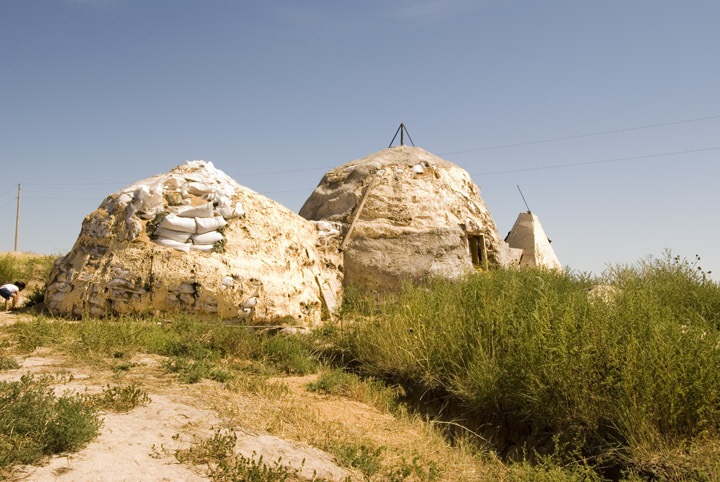 We have now seen examples of homes built out of rammed earth, straw bales, hemp, and rice hulls (in the shape of a dome). The impetus behind the construction was different in each case. 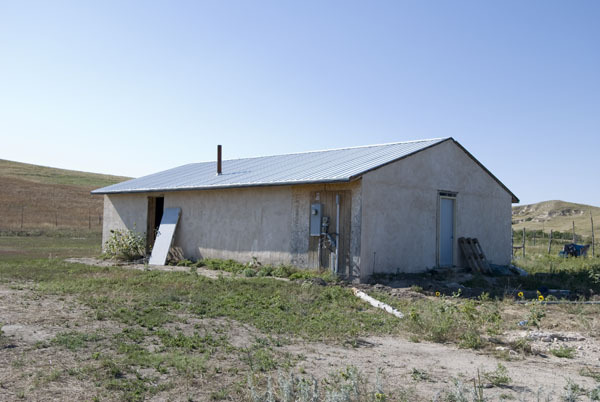 The first experimental project we saw was a rammed earth house built by Habitat for Humanity in 1994, when Ex-president Jimmy Carter brought volunteers to Eagle Butte to build much needed housing. Of the 30 homes built, it is the only non-traditional design, and not much is known about it. 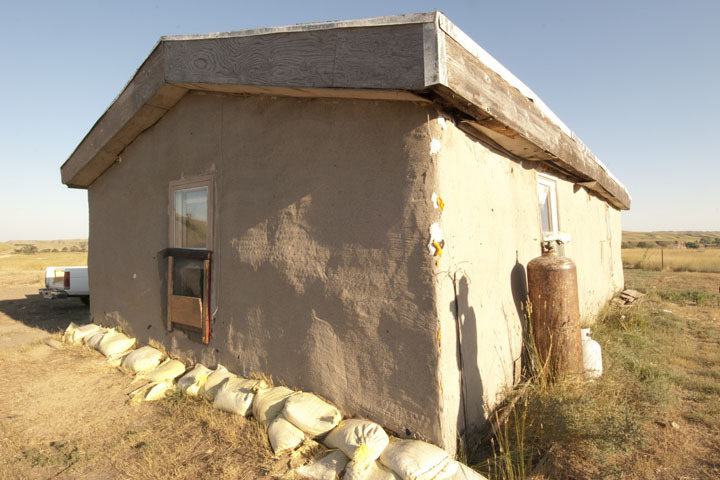 We asked the builder currently running Habitat for Humanity on the reservation, and while he did know that the house was “different,” he did not know it was made out of rammed earth. We introduced ourselves to the owner, and learned that it was constructed from rammed earth. The house was notably cooler than the typical reservation housing we’ve been in. Due to thermal mass created by the thickness of the walls, the hot sun has a harder time penetrating the structure. The resident agreed that the house also felt sturdier than most he had been in. He felt the overall construction technique was good but still had a few complaints. The windows and doors were not sealed well, the layout was cramped, and because of the permanent and structural nature of the rammed earth walls, he couldn’t modify the unit. The house has four bedrooms, one bathroom, and a long kitchen/dining/living room area. He and his wife live there with their five children. He did not participate in the initial construction or design, but moved in when it was partially finished. He believes the earth had to be shipped in from elsewhere. He and his wife did much of the finishing work on the interior, and he said that he enjoyed the freedom and control of doing work around the house himself. We saw a dome home made from bags filled with rice hulls and earth mixture on the Pine Ridge Reservation, south of Sharp’s Corner. The dome home is being built on the American Horse family’s property with the help of an organization called Nature’s Compassion. The home was partially constructed last summer, and the family is expecting volunteers to come back in the next few weeks to finish the project. The dome has an internal structure made out of burlap bags packed with soil, and an exterior insulating shell of bags packed with rice hulls. Windows and doors are framed out with 2×4’s within the domes. The house is designed as two dome shaped rooms bridged together and an adjoining wooden tipi. Even unfinished, the structure was very cool inside. The main room has a hook up for a wood-burning stove (which was recently stolen by vandals), a hook up for hot and cold water and a lofted space for sleeping. The bathroom is spacious and may get divided up due to its size. We’re not sure how many people this dome home can accommodate, but look forward to seeing its progress in the coming weeks. 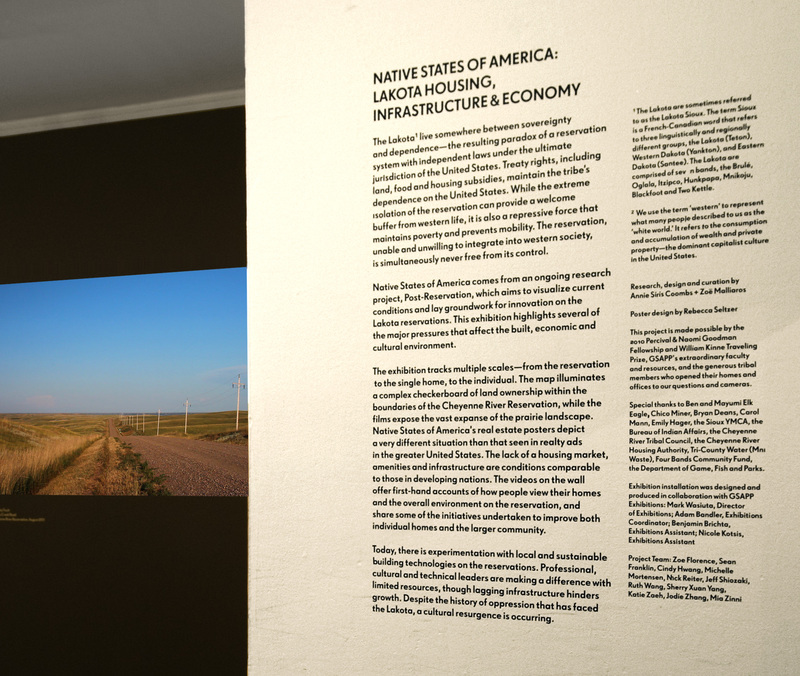 In order to revitalize and maintain the Lakota way of life, he is committed to a self-sufficient lifestyle, independent from the US Government. 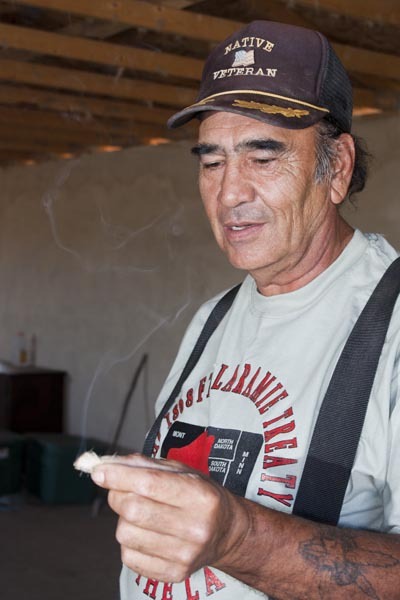 One of the ways he has tried to create a healthy cultural economy on the reservation is by growing hemp on his family’s sovereign land. He wanted to grow something could be built with, would thrive in the harsh climate, and could withstand the wrath of grasshoppers. Hemp was a seemingly perfect solution, with its high insulating properties in both refined and unrefined states. He was growing an acre’s worth of hemp that he intended to refine, sell and build with when he was visited by the DEA, who ordered him to destroy the crop and shut down operations. The details of how this is possible are confusing, as the tribe had passed a law legalizing hemp on Pine Ridge. While the legal battle is still playing out, Alex continues to live on his family land and remains committed to building with hemp, legally imported from around the world. He sources refined hemp insulation from Germany, hempcrete and hemp hulls from England, and hempboard from Canada. With these materials, he has been building a community center, which is beautifully constructed. Currently, it is one large space with a window, but will be divided up into bathrooms, a cooking area and a gathering space. The project is still under construction, waiting for more funding. 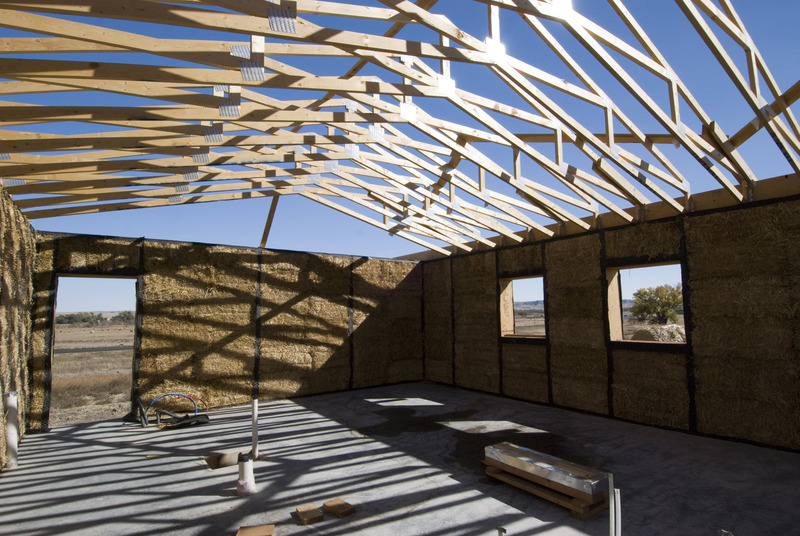 The construction process is fairly simple, combining traditional and new building techniques. The building is framed with hand-cut 2×12’s from his property, then surrounded with formwork made from 4’ x 8’ sheets of plywood. This formwork is packed with dried hemp hulls mixed with water, tightly filling the thick frame. When this is dry, the formwork is removed and chicken wire is applied to the packed wall, then layered with medium grade hempcrete. Finally, finish layers of fine grade hempcrete create a smooth wall with high insulating and structural qualities (it withstood a test blast from a large shotgun), and no chemical additives. Hempboard flooring completes the building. We were struck by Mr. White Plume’s desire to live in an independently sustainable way – both environmentally and financially. He did not want to receive any aid from the US government, and he did not want bring products mass produced with chemicals, from building materials to meat, into his home. This desire for independence would seem to be a positive thing to the US Government, which we have learned spends a lot of money to sustain the lives of many on the reservations we have looked at. Yet, they prevent Alex from growing a crop that would further help him and others become more self-sufficient. Very few crops grow out here, but hemp appears to thrive. It contains no drug qualities, and would be a major source of income, material, and empowerment for people on these reservations if it were legalized. 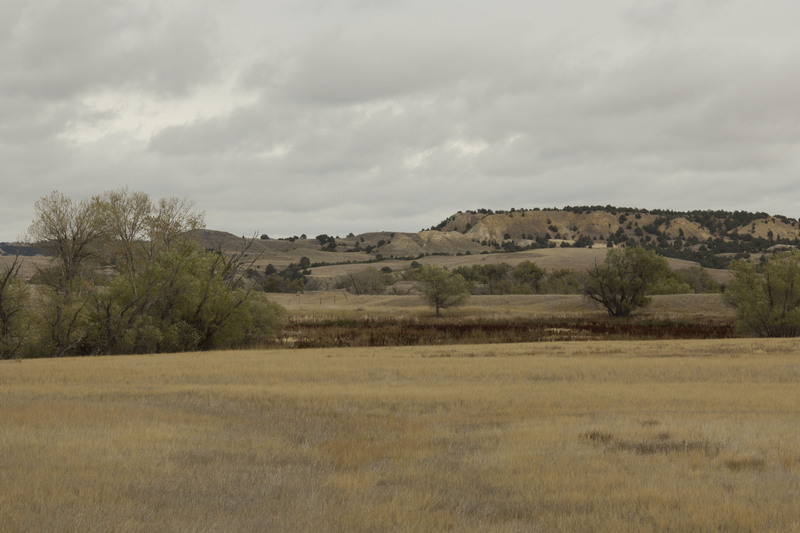 Finally, the last alternative construction technique we saw was on Bryan Dean’s ranch near Slim Butte, Pine Ridge. We did not get to meet Bryan, as he was at a community meeting, but we did meet with the generous people who were currently staying on his ranch studying permaculture and constructing a straw bale structure. The ranch was like a sustainable living lab. They have made a bio-diesel conversion device, wind turbines, a solar powered outdoor shower, and are currently working on a rainwater collection system and a large straw bale structure. 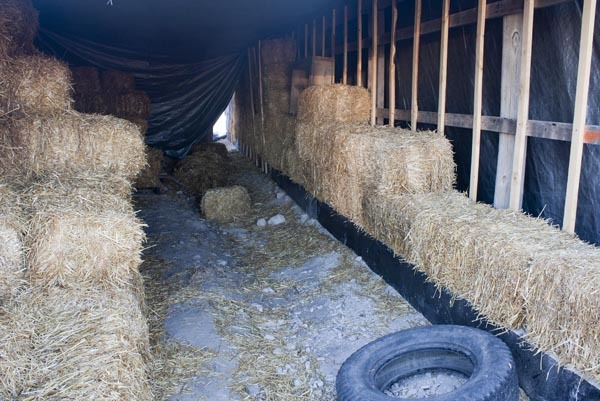 The group emphasizes simple techniques that are inexpensive, and straw bale construction seems to be a great use of local materials and communal labor. The foundation for the house is a pit filled with gravel, then a base is built up using 2” x 20” sealed wood planks and filled with more gravel. Bales of straw that are roughly 18” x 20” x 36” are stacked on top of this base, then held in place by thin wood slats on either side. Once the walls are complete and smoothed out, the exterior will be plastered with clay made from the Slim Butte area mixed with lime. We saw an early example of plastering, but were told that it will be smoother upon completion. The ranch has an open house every Saturday for anyone in the area who wants to check it out. We highly recommend it! Seeing these four housing types gave us a tremendous amount of hope for the future of housing on the reservation. The four types of structures were relatively inexpensive and easy to construct, focused on utilizing local materials, and were built with the local climate in mind. With motivation, a small initial investment and few people to help out, living situations can be created that are far sturdier, better insulated and better tailored to local needs than a trailer or HUD-style home. We recently met with the Cheyenne River Housing Authority, the tribal office responsible for managing federal housing programs on the reservation. 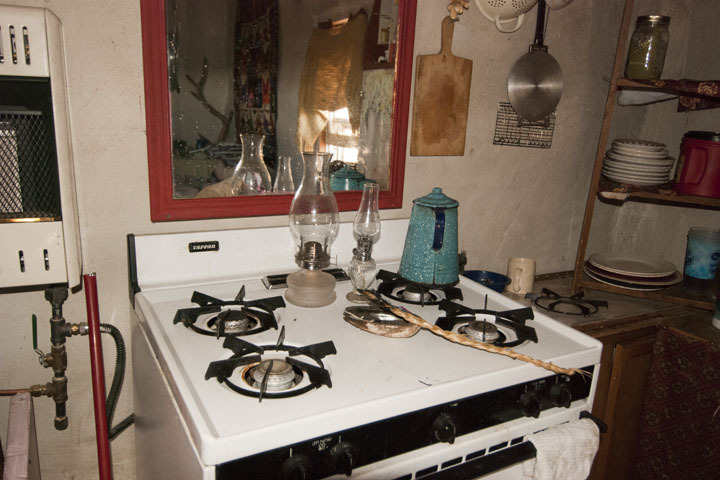 It was founded on this reservation in 1963, and is funded by the U.S. Department for Housing and Urban Development (HUD), which is often the scapegoat for the poor design and conditions of housing here. Until the 1980’s, the Housing Authority had little control over its designs, and the mandated HUD designs were of poor quality. 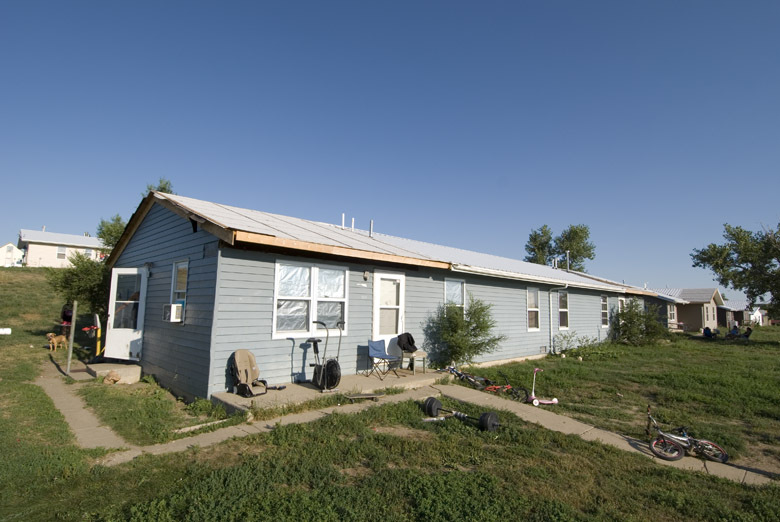 While the Housing Authority has historically been the main provider of new housing on the reservation, there are other housing organizations that have built similar designs with similar construction materials and techniques. In general, these homes were not designed to withstand the harsh climate extremes. While it would be easy to blame the Housing Authority, HUD, and the other providers for substandard housing or maintenance, we have also seen that the politics of subsidized housing are not that simple. 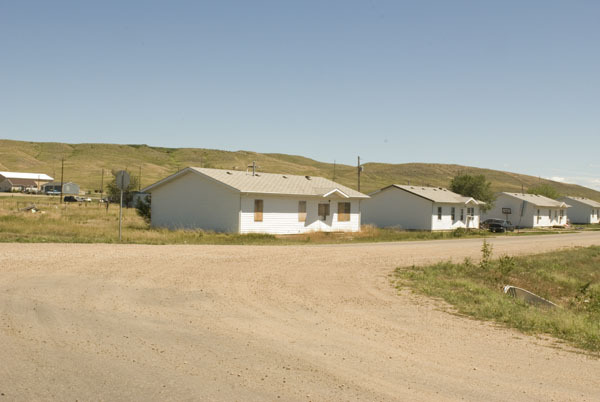 Housing on the reservation often looks very similar, and while the Housing Authority has built the majority of the housing here, much of it has since been purchased outright and is thus no longer their maintenance responsibility. 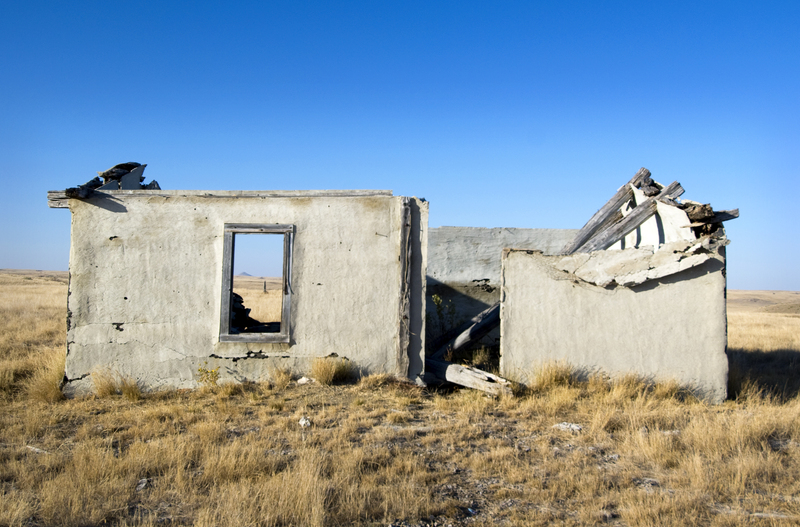 However, the general state of housing, characterized by vinyl or wood siding, broken windows (often single pane), shingled or metal roof (preferable), and single-story timber frame design, is makeshift and in varied states of deterioration. The biggest problem we’ve heard from people regarding their housing is that the windows and doors are not tightly sealed and that they are expensive and/or impossible to heat and cool. Houses tend to be drafty in the bitterly cold winters and hot in the summers (it was recently 109 degrees). While double-pane windows are required by building code on the east coast, where winters don’t get nearly as cold as they do in South Dakota, here we’ve see many houses with single-pane windows showing few upgrades/replacements. The Housing Authority assured us that they currently follow the International Building Code, however there is no Department of Buildings here. Any inspection of a property would be by internal inspectors. Other builders have told us that there is no enforced code. Some of the damage and poor condition of houses can be attributed to the maintenance (or lack thereof) by the various housing agencies, but some is also due to mistreatment and neglect by tenants. Without a stake in one’s house, there is less incentive to upkeep or improve one’s space, especially when money is tight and homes are overcrowded. Furthermore, a large percentage of subsidized housing can create an economic culture of poverty, where there is no incentive to invest in one’s home and there are more incentives to be unemployed than employed. Here, Housing Authority rental housing is income based, so if you don’t work, you pay less or nothing at all. If you do work, your government commodities (similar to rations and/or food stamps) can be taken away and rent will increase with your salary (until hitting a certain cap). While many people do take pride in being independent, others choose to accept the handouts. For those who do work, rent remains a percentage of their income, so there is little incentive to earn more. There is practically no private rental market on this reservation, so one must work with the Housing Authority or one of the other non-profits operating on the reservation to find a rental unit. This process is extremely slow, and the housing stock is relatively stagnant. 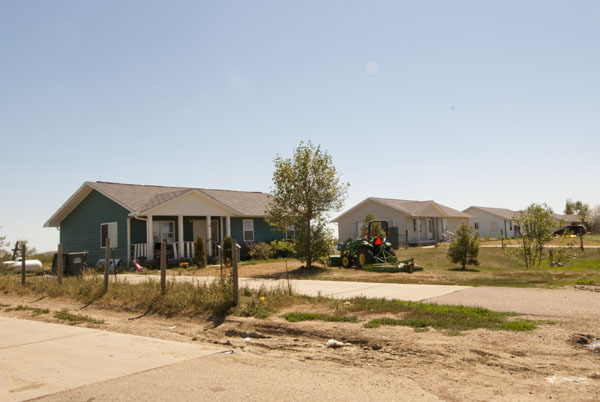 The Housing Authority currently manages approximately 600 rental units on the reservation, while the waiting list for housing has over 400 people on it. The first person on the list for a one-bedroom house submitted their application in 1998. We imagine they may need more than a one bedroom, 12 years later. The person we spoke with regarding the Housing Authority’s “modernization program” informed us that the oldest HUD designed houses from the 1960’s can have exterior walls constructed out of 2 x 4’s. This doesn’t leave much room for insulation. 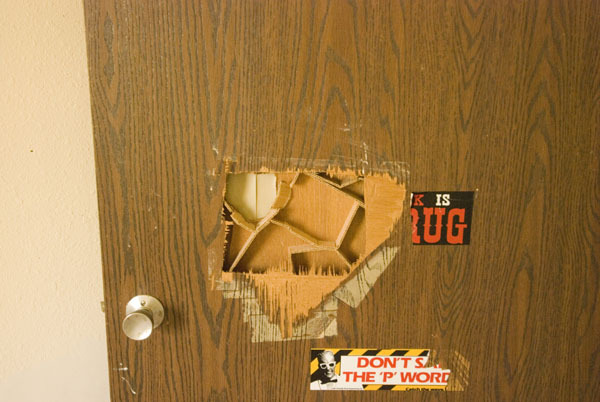 The “modernization” department is responsible for construction updates due to damages and normal wear and tear, but renovations can also be needed in the case of “tenant abuse.” This is when the tenant so badly abuses the property that it requires renovation. The way “modernization” works is that the Housing Authority periodically inspects their units and reports the “worst of the worst” conditions. Those properties get put on a list for modernization, but a tenant cannot request their home to be modernized. We’re hoping to see examples of houses before and after this modernization process next week, but were told that repairs can range from kitchen/bathroom updates to full interior renovations. With regard to ownership, we met with a woman at the Housing Authority who is responsible for home ownership educational programs and funding. She spoke with us about their relationship to the reservation, the housing types they provide, the setbacks because of water shortage, and the Housing Authority’s vision for the future of housing on the reservation. She told us about several mortgage packages, educational programs and advisement that provide options and support for tribal members who are interested in purchasing a home. However, it is currently difficult to build new housing because of a water shortage, so they can only advise people on purchasing already built homes or trailers. In the past, the Housing Authority did have a rent-to-own program, but this is no longer available. We were really excited to meet with the Housing Authority and hear their side of the story. It appears that the biggest setback to creating new housing at the moment is the water shortage. In essence, the existing water pipes and reservoir for the reservation cannot accommodate the demand, and Tri-County Water, the sole provider for the reservation, has put a hold on new installations and water meters. A new water reservoir has been created but the funding hasn’t come in to lay new pipes and finish the pumping station. This could take a couple of years to be completed. Until then, there will be no new traditional water lines and thus, no new housing unless you pay for an alternative to the county water system. At the moment, the Housing Authority does not plan to explore alternatives like digging wells or developing rainwater collection systems, as this is too costly for on their budget. Thus, they will not build until the water shortage is solved. There have been roads and infrastructure laid for a new housing development near the main town of Eagle Butte, called Badger Park, which is currently on hold due to the water shortage. 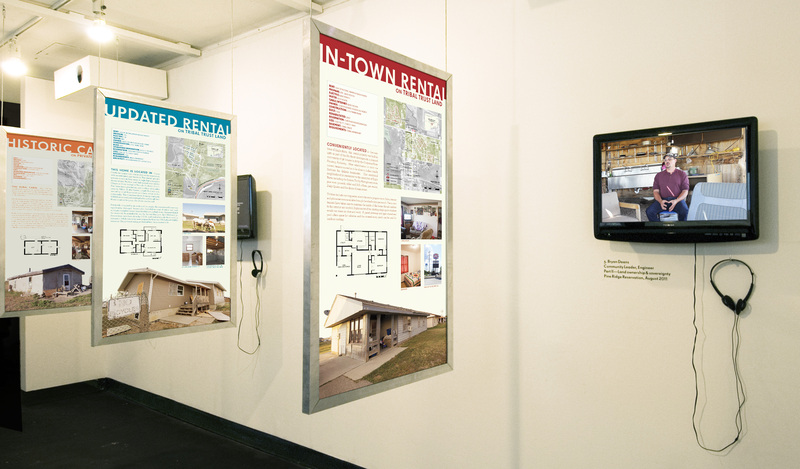 The plans for this community do include a number of new ideas and experiments, including alternative building techniques and updated designs by an architecture firm in Pierre. 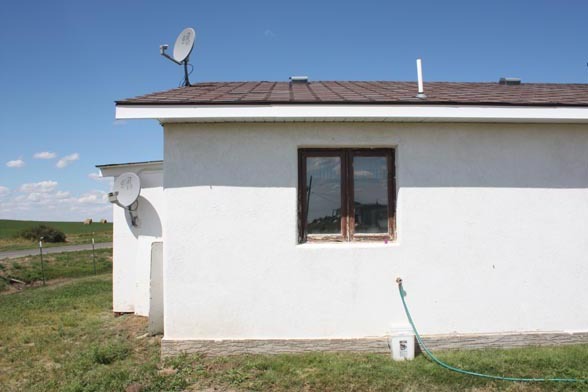 These houses would be built in modular pieces by the Housing Authority on a lot in Eagle Butte, and then moved to their sites to be assembled and hooked up. We are planning to meet with this firm and other Housing Authority officials to discuss the details of these designs. We also learned of an exciting project in the residential community of Cherry Creek which fell under the Housing Authority’s modernization program for rental units. Six houses have to be moved to a new location in town because they are in a flood plain. The Housing Authority received government funding and will experiment using geothermal heating in these homes. This could drastically reduce the cost of heating in the winter and provide an example for implementation of energy-conscious building techniques. While we felt like our initial meeting at the Housing Authority provided a lot of new information about their scope of management and the housing stock, we still have more questions about specific building techniques and historic data. We want access to the GIS maps that show land ownership, roads, utilities, geology and housing location/vintage, but are having trouble getting this information. We hope this will not be necessary, but an attorney for the Department of the Interior in Washington DC has advised us that we may have to file a Freedom of Information Act request if we keep getting blocked from accessing information that is public. We have now met with the BIA, Housing Authority, and Games, Fish and Parks, all of whom have been incredibly generous with their time and discussions of their work, but reluctant to share what we feel is important spatial information. Each organization has pointed us towards another to get this information, when they all have it in one form or another.